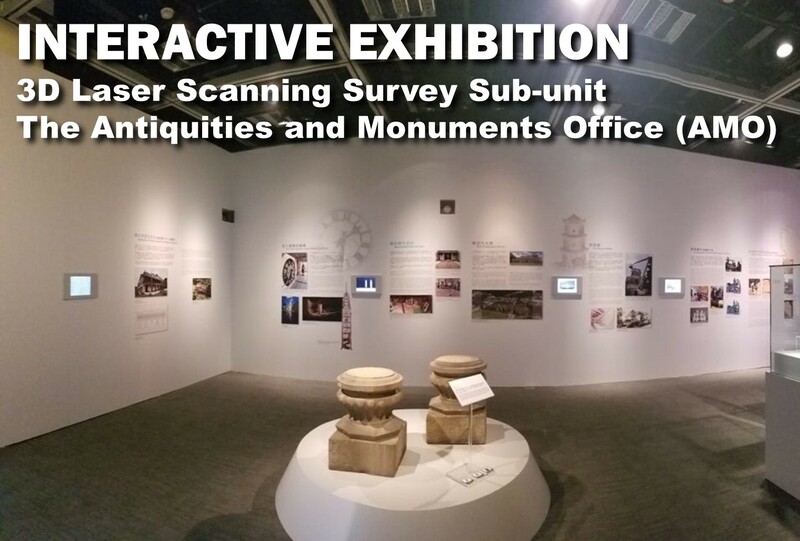 A 3D Laser Scanning Survey sub-unit exhibition has been launched in the antiquities and monuments office (AMO). There are many interactive tablets mounted on the wall for introduction to different exhibits. The Antiquities and Monuments Office (henceforth referred to as “AMO”) has set up a 3-Dimensonal (3D) Laser Scanning Survey Sub-unit in 2016, which has applied this innovative technology to collect precise 3D survey data by scanning historic buildings such as ancestral halls, lighthouses, temples, cathedrals; rock carvings as well as the relics unearthed, and make use of the precise 3D survey data to prepare drawings for monitoring the condition of these historic buildings and for conservation of the relics. The 3D survey data is also used to generate solid models as a reference and proof, and for research when restoring historic buildings, as well as building up an archive on the 3D data of historic buildings and relics unearthed. Through the display of selected important architectural components and objects from historic buildings, “point cloud” images, 3D printout models, photos, videos as well as interactive exhibits, this exhibition introduces how AMO applies innovative 3D laser scanning and 3D printing technologies to heritage conservation and education to assist in the restoration of historic buildings and to raise the public’s knowledge and interest in Hong Kong’s heritage.